One machine - one pass system performs the husking, separation of husks and brown rice, whitening and bran removal. Sturdy and simple construction for low running costs and easy operation. Electric motor or diesel engine driven. - A vibrating screen attached in the feed hopper will remove large impurities such as straw, rachis, branches etc from paddy before husking. - Between the feeding hopper and husking chamber a special magnet is installed to remove ferrous particles before husking. - The husking is done by rubber rolls which rotate in opposite directions at different speeds. - The integral aspirator separates the husks, immature grains and brown rice by a fan. 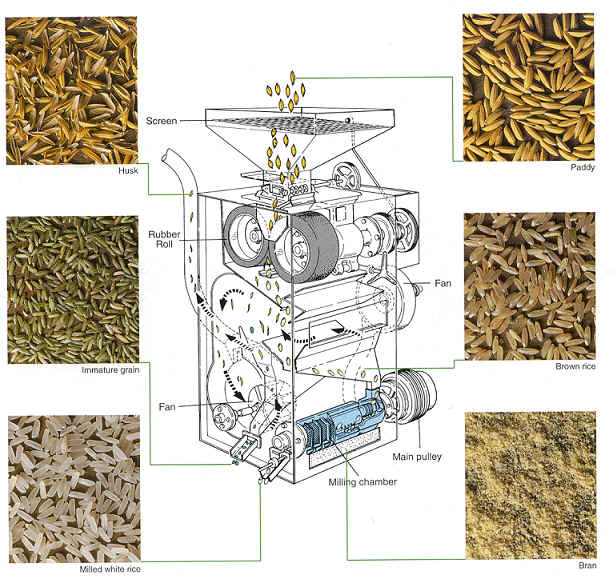 The husks and immature grains are discharged outside the machine while the brown rice is fed into the milling chamber. - In the milling chamber the brown rice is milled into white rice by the friction method. - The bran is removed through the slotted screen by air injected through the milling roller by an independent fan. The machine can be powered by electric motor or diesel engine, making it suitable for installation in remove and developing areas. Depending on rice variety and motor size, capacities in the region of 300-750 kg per hour can be achieved.